Alvin Irby, founder of Barbershop Books, is on a mission to get kids reading in the barbershop. Last year, Barbershop Books won a $10,000 Innovations in Reading Prize from the National Book Foundation. Our series Take A Number is exploring problems around the world — and the people who are trying to solve them — through the lens of a single number. The solution first: 15. More precisely, 15 books. That's Alvin Irby's answer to a problem he knows all too well as a former kindergarten teacher: How to get children of color excited about reading if they don't have much experience with books or reading outside of school, and the books they see inside of school don't speak to them. One day in March, Irby emerges from the subway in Harlem grateful for the grey hooded sweatshirt under his heavy winter parka. The snow falls in crystals the size of cornflakes. He wears glasses with translucent frames, a touch of cool for a man whose backpack is full of kids' books. When he enters Levels Barbershop, on Lexington Avenue, the place thrums with electric razors, conversation and a movie on the flatscreen. One whole wall is a varied patchwork of exposed brick and mirrors. Overlooking the proceedings is a painting of the patron-saint of movie barbers: Eddie Murphy's foul-mouthed coiffeur from "Coming To America." It's mid-afternoon when Irby walks in, a man on a mission. He needs a trim from his go-to barber, Kenny, but he also wants to check in on his 15 books. "So the bookshelf is back underneath the coat shelf," he says, shedding his layers and pointing to a little book case made of wood and red canvas along the back wall. Emblazoned on the canvas is the name, "Barbershop Books." The small shelves brim with children's books with titles like Not Norman and Chicka Chicka Boom Boom. But there are only 12. A few titles have disappeared, as they do, so Irby's here to replace them. Before he gets to the shelf, though, he freezes alongside the black vinyl bench that splits the shop in half and cracks a triumphal smile. "This is evidence that it's being used!" he says, pointing to two books for beginning readers that have been left on the bench. He picks one up. "We have Ninjago, which is one of the books that often gets permanently borrowed. It's about little LEGO characters who are ninjas." "Now, this is the thing: Would these be used for instructional purposes in the classroom?" It's a rhetorical question. The answer, too often, is No. "But they should be!" Irby yells. Alvin Irby wears many hats. He is a stand-up comedian, a children's book author, a former kindergarten teacher, the founder of Barbershop Books and, above all, a dynamo. He speaks loudly, even when answering questions in a quiet office that's been emptied by the snow. His nonprofit has put a curated list of 15 books — all picked by kids — in dozens of barbershops, in predominantly black neighborhoods, across the country. And that's not counting the many barbers who have heard his story and done something similar on their own. Irby, who just turned 33, says he's hoping to help children of color identify as readers. That means, first and foremost, that reading should be fun. It also means kids need to see their lives and interests reflected in the stories they read. But, Irby says, the publishing industry has a long way to go. When he went to a big book convention recently, few of the kids' titles on display had diverse characters. And those that did felt both foreign and not remotely fun. "Slavery, civil rights, slavery, civil rights," Irby says, rattling through the books' subjects. "Biography, slavery, civil rights, old dead black person." While he was there, Irby also asked the librarians he met if they could name two laugh-out-loud picture books with a black protagonist? Irby's not simply complaining about a problem. He's written his own solution — a children's book, called Gross Greg, which he self-published because traditional publishers showed little interest. "It's about a little black boy who loves to eat his boogers," Irby says. "You call them boogers. Greg calls them delicious little sugars." The boogers here aren't a frivolous distraction. They're the point. Books about slavery and civil rights have their place, Irby believes, but little black boys and girls deserve books that allow them to be children. And to laugh like children. Too many children of color, Irby says, are coming into kindergarten without much exposure to books or reading. While they may lack reading skills, their books — and their schools — often lack what Irby calls cultural competency. By that he means the ability to translate what they want kids to know or do into reading experiences that children find relevant and engaging. In a recent TED Talk, Irby explained, using a metaphor from stand-up comedy. "Before going onstage, I assess an audience. Are they white? Are they Latino? Are they old, young, professional, conservative?" Irby says to the small TED audience. "While performing in a church, I could tell bar jokes, but that might not result in laughter." Teachers, schools, and book publishers, he says, need to think of kids the same way. "As a society, we're creating reading experiences for children that are the equivalent of telling bar jokes in a church, and then we wonder why so many children don't read." Irby says, schools need to focus less on leveled, out-of-touch books and reading tests that leave kids feeling defeated and try listening more. Ask students, What are your strengths, your experiences, your interests? "Once you figure out how students identify," Irby says, "then you can begin to craft [reading] experiences that are customized to who they are and what's most important to them." Back in Levels Barbershop, what's most important to Vincent, a sixth-grader and son of a barber, is Diary of a Wimpy Kid, the book Irby just replaced. Because the hero's story feels real — and really funny. "Everything goes wrong when he thinks that it's gonna go right," Vincent says. "Or, when something good's about to happen, it just gets ruined by his brother, Roderick." Vincent's enthusiasm — he says he's read every last one of the shop's 15 books — is all the motivation Alvin Irby needs to keep growing Barbershop Books. And it is growing. And now, how do you get kids excited about books if they don't have access to them outside of school and the books they see in school don't speak to them? One answer may be in the number 15. NPR's Cory Turner brings us the latest story in Take A Number, our series about people trying to solve all kinds of problems through the lens of a single number. ALVIN IRBY: Hey, what's up, man? UNIDENTIFIED MAN: What's up, man? 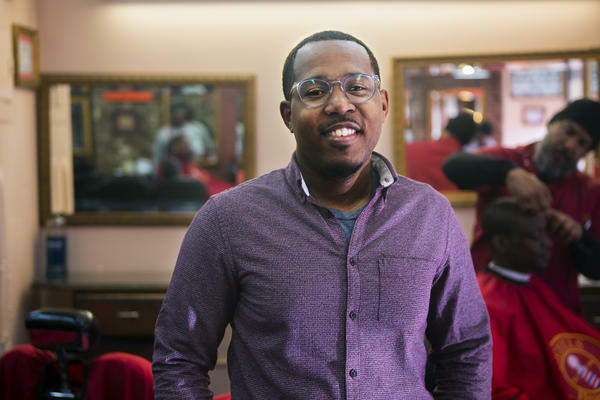 CORY TURNER, BYLINE: Levels Barbershop in Harlem is humming when Alvin Irby walks in, a man on a mission. He needs a cut from his barber Kenny, and he wants to check in on his books. TURNER: Irby points to a little bookcase made of wood and red canvas, full of children's books. There's supposed to be 15 different titles. A few have disappeared though, so Irby's here to replace them. Before he gets there, he freezes and smiles, eyeballing a black bench in the middle of the shop. IRBY: This is evidence that it's being used. IRBY: We have "Ninjago", which is one of the books that often gets permanently borrowed, about little Lego characters who are ninjas. TURNER: Irby takes it back to the bookcase and adds another favorite from his backpack, "Diary Of A Wimpy Kid." And then this man on a mission drops his mission statement. IRBY: Now this is the thing. Would these be used for instructional purposes in the classroom? TURNER: The answer often is no. IRBY: But they should be. IRBY: Slavery, civil rights, slavery, civil rights, oh, a biography, slavery, civil rights, old dead black person. TURNER: Irby's not just complaining. He's written a very different kind of children's book called "Gross Greg." IRBY: It's about a little black boy who loves to eat his boogers. You call them boogers. Greg calls them delicious little sugars. TURNER: For Irby, laughter is key to learning and a great way to connect with young readers. Too many schools, he says, fail to translate what they want kids to know or do into reading experiences that kids find relevant or engaging. In a recent TED talk, Irby explained this with an analogy from stand-up. IRBY: Before going on stage, I assess an audience. Are they white? Are they Latino? Are they old, young, professional, conservative? IRBY: We're creating reading experiences for children that are the equivalent of telling bar jokes in a church. And then we wonder why so many children don't read. TURNER: Irby says schools need to focus less on leveled, out-of-touch books and reading tests that leave kids feeling defeated. And they need to listen more - to ask kids about their strengths and their experiences, what they like. IRBY: Once you figure out how they identify, then you can begin to craft experiences that are customized to who they are and what's most important to them. TURNER: Back in Levels Barbershop, what's most important to Vincent, a sixth-grader and the son of a barber, is "Diary Of A Wimpy Kid" because the hero's story feels kind of familiar and because it's really funny. VINCENT: Everything goes wrong when he thinks that it's going to go right. Like when something good is about to happen, it just like gets ruined by his brother Rodrick. TURNER: Vincent's enthusiasm - he's read every one of the shop's 15 books - is all the motivation Alvin Irby needs to keep growing Barbershop Books. Next month, he's hosting a New York City fundraiser in a comedy club. Cory Turner, NPR News, New York. (SOUNDBITE OF GREGS TAGEBUCH'S "GIBT'S PROBLEME? - TITEL 01") Transcript provided by NPR, Copyright NPR.